Welcome to Queensland's gateway to gardening - a collection of news, information, resources and ideas of interest to gardeners, especially residents of Queensland, Australia. Get Results Gardening is a weekly mini-magazine delivered via email. It offers high-quality gardening information for SE Qld while keeping the inexperienced and even the reluctant gardener in mind. Easy plants, timely tips, ideas, motivation. Get a 3 month free trial subscription. To receive the above edition in your inbox, email before 10am Friday 12/04/19. If you're organising a garden show, open garden or similar event in Qld in 2019 and you already have a date locked in, be sure to submit some information now for inclusion in the Queensland Gardening Events Diary. Dates can be added a year ahead or even more, helping give your event plenty of exposure to potential visitors and exhibitors. Basic listings are free and featured listings are now available for a modest fee. Go to the page for more information. Australia's most commercially successful "bushfood" so far is the macadamia. They're grown on a mass scale around the world, but those plants are the result of a century and a half of breeding and selection. Meanwhile, the progenitors of these plants and their relatives are rare and threatened in the wild. One of the initiatives to save the survivors and the genetic diversity they contain is The Wild Macadamia Hunt. It's one you can get involved in, too. Macadamia species are native to rainforests of SE Qld or Northern NSW and many private properties could contain remnant wild trees or their direct descendants. Extensive planting of macadamias also means that many trees are found outside of rainforest. If you live in the macadamia's natural range and know of an old specimen (~100 years or more), you can register the tree and send in some photos. If the submission warrants further investigation, you'll be sent a special kit which will enable you to collect a leaf sample (with permission!) for genetic analysis. You can also join the Wild Macadamia Hunters Facebook group to share the story of your tree and learn more about macadamias. Thanks to Healthy Land & Water for contributing to this story. 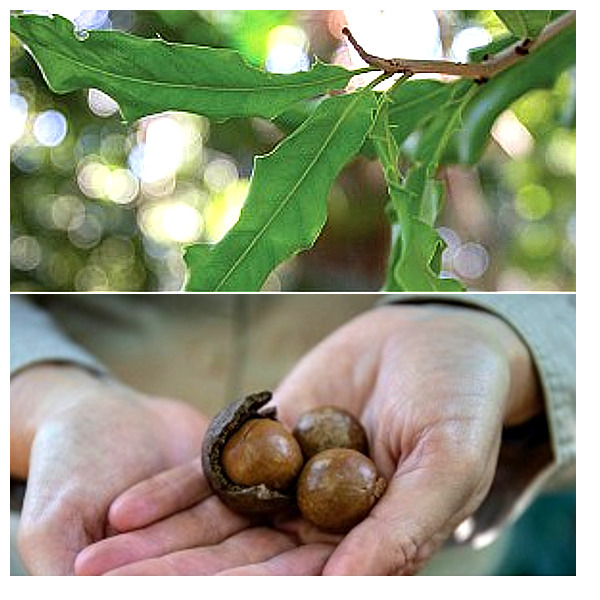 The Wild Macadamia Hunt is an initiative of Healthy Land & Water with support from the Brisbane City Council and the Macadamia Conservation Trust. More news about plants and gardens in Queensland, plus other useful and interesting horticultural news from around the world. Gympie Regional Council have just announced their Leaf Hopper Integrated Pest Management Strategy, which will combine leaf stripping (to stop associated rot from spreading) and biocontrol with a parasitic wasp. Transplanting from areas where there is an abundance of young plants available will be done and a propagation program from collected seed is planned, too. Source: Council to protect Rainbow's Pandanus Palms, Gympie Regional Council. Many readers will know of David Austin, or have encountered his world famous roses. Mr Austin passed away on 19 December 2018, aged 92. His breeding work brought the beauty and fragrance of historic roses to new varieties better suited to the demands of modern gardeners, including repeat-flowering, disease resistance and colour range. Meanwhile, Nanango State High School are the champions for the second year in a row in the University of Queensland Sunflower Competition, beating 102 other high schools across Australia. Using a specified seed variety and pot size, students are allowed to experiment with cultural factors such as growing mix, fertiliser and watering to achieve the heaviest plant possible in a 12-week period. Other awards were made in several categories including the tallest and most ornamental sunflowers. View the full results here. Steven Fritz of Marburg has taken out the Royal Queensland Show (Ekka) Giant Pumpkin Competition with a 206kg fruit. Competition veterans Tony and Geoff Frohloff came in second and third. A 40kg entry from Bullyard State School (near Bundaberg) won the school competition. Some older news items of continuing interest have been moved to appropriate subject pages. Check the Guide to Pages or use the search function at the top of the page.